"There's no such thing," says the storybook hero to his sidekick just before his alien time machine takes them to a storybook forest to meet another storybook hero. "Old fashioned heroes only exist in old fashioned storybooks." And the Doctor would know. After spending hundreds of years dashing around with a young face — trying to play the part of the gallant hero his companions wanted him to be — the Twelfth Doctor is resetting the clock. In this season's first two episodes, he's done pretty much all he can to remind Clara — and us — that he isn't always such a warm and cuddly fellow. He's not even entirely sure he's a good man. "I've made many mistakes," he told Clara in the premiere. He wants her to travel with him on the TARDIS, but he doesn't want her to be under any illusions. His new face, his surly manner, his matter-of-fact attitude toward the death of those around him: all seem like warning signs to put people off. The Time Lord equivalent of a snake's red stripes. A "snarl" the Eleventh called it when the TARDIS invented an off-putting cliff last year. After all, believing in the Doctor tends to get you stuck in an alternate dimension, or with your favourite memories erased, or zapped back in time by a statue. Heck, in Season Six we met a minotaur monster who devoured that kind of naive faith. No real person can live up to the title of "hero". It's a fantasy. If you get your hopes up, as the Doctor tells Clara on their way to Sherwood Forest, "You'll only be disappointed." So when Robin Hood does indeed appear, it's a challenge to the new Doctor's whole deal. Robin seems to be the carefree hero that the Doctor spent so much of his last two incarnations pretending to be. (And the ridiculous Prince of Thieves annoys the Twelfth Doctor much like the Eleventh and Tenth annoyed the War Doctor.) Last week, our favourite Time Lord was eager to believe that Rusty the Dalek was evil — so he wouldn't have to confront the truth about his own genocide of the species. 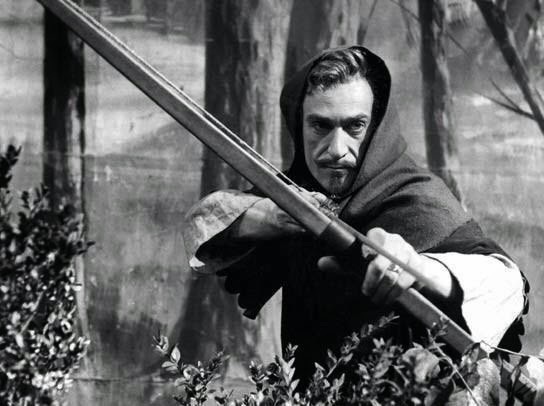 This week, he's eager to believe that Robin Hood couldn't possibly exist — so he doesn't have to confront his own limitations as a heroic figure. The whole storybook setting is an insult to him. He's played the role of storybook hero before and he knows how it ends: by losing Amelia Pond, that girl with the fairy tale name. He's relieved when he finally does discover that something evil and robotic has been lurking behind the scenes at Nottingham. "At last," he says, "something real. No more fairy tales." But as the skeptical Doctor begrudgingly learns, Robin Hood really is real. The fairy tale hero is flesh and blood — even if the Sheriff isn't entirely. It's just that Robin Hood isn't quite the carefree hero he's pretending to be. Much like the Eleventh Doctor, his dramatic flair is something of an act. That trademark over-the-top laughter masks a deep sadness. And Clara, who spent so much time with the Eleventh, sees through the facade right away. Robin Hood doesn't believe in storybook heroes any more than the Doctor does. But as he tells the Time Lord in their final scene together outside the TARDIS, he does believe in playing the part of a hero. "If we both keep pretending to be," he explains, pausing to demonstrate his theatrical laugh, "perhaps others will be heroes in our name. Perhaps we will both be stories. And may those stories never end." In Robin Hood's case, of course, it worked. Nearly a thousand years later, we're still talking about the heroic outlaw who steals from the rich and gives to the poor. Even if we only remember him as a story — and not as a real man. The power of storytelling has long been a major theme of Doctor Who — especially during the Moffat era. It was pretty much the key to the main arc of Season Five; the way the Eleventh escaped oblivion when he reset the universe. "We're all stories in the end," as he told the young Amelia Pond at her bedside. And given that existential reality, the story is the most important part. But that kind of thinking doesn't come quite as easily to his new incarnation. Storytelling is a social act; the Twelfth is more than a bit anti-social. "What the Doctor has forgotten," Emily Asher-Perrin writes in her excellent review of the episode, "is that people don't think of themselves as heroes—they are made into heroes according to the perceptions of others." For Robin Hood, that person is Maid Marian. "It was Marian who told me that I must stand up and be counted..." he tells Clara. "It is beholden on me to be the man Marian wanted. To be a hero..." He might not believe that he actually is, but he does try. And as Clara pointed out last week, "I think that's probably the point." For a moment, perhaps, Marian fills that same role for the Doctor. As they escape from the clutches of the Sheriff's robots, she gives the Time Lord a kiss on the cheek — and he lingers on it for a moment, surprised. But for the most part, of course, that role is played by the Doctor's companions. They've always been mirrors for him — a way for him to see himself. Even more so since this last regeneration, while he's struggled more than ever to figure out exactly who he is. And Clara is there all the way though this episode, reminding him of the way she sees him: as the stuff storybooks are made of. She has no problem believing Robin Hood is real — she's seen what the Doctor can do. She, we hope, will inspire him to keep trying to achieve that impossible ideal. "When did you start believing in impossible heroes?" he asks her once they've met the famous outlaw and his band of merry men. "Don't you know?" she answers. And as she turns away, the Doctor takes a big bite out of a great red Biblical apple. Then he immediately pulls out his sonic screwdriver and runs some tests on it, still not convinced it's real. - Sensitive to all the beheadings in the news recently, the producers cut a scene from this week's episode. The Sheriff loses his head in his final battle with Robin Hood — then pops it back on cuz he's a robot. The spaceship apparently landed on him and he was repaired with mechanical parts. Knowing that helps to explain some of his subsequent lines and the reason the robots accepted him as their leader by making it clear that he's a cyborg — which, by extension, might have made it clearer that Robin Hood isn't. 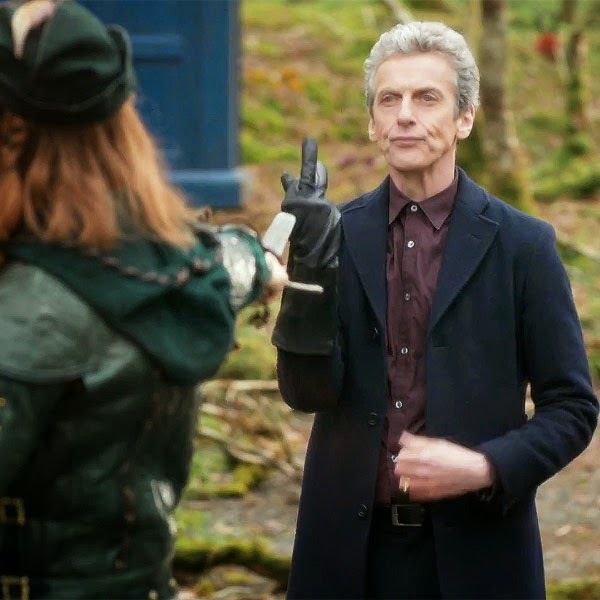 - It's a fleeting moment, but as the Doctor puts on his glove to fight Robin Hood, he toooootally lets his middle finger linger in the "up" position. As evidenced by the first screencap above. - Last week, Clara wasn't even sure the Doctor wass a good man. This week, she's convinced he's a hero. I'm loving all the depth they've given her character this season. But that particular arc seems a little rushed to me. - "All property is theft!" Robin Hood foreshadows the slogan of the French anarchist Pierre-Joseph Proudhon from about 700 years later. - The Doctor loves his spoons. Playing the spoons was one of the trademark quirks of the Seventh Doctor. - The Doctor's doing lots of equations so far this season. Online consensus seems to agree that they have something to do with finding Gallifrey. Read our previous recap: "Doctor Who & The Question of the Good Dalek" here.